AnyMP4 Audio Converter 7.2.10 Free Download - Convert audio/video to popular audio formats like MP3, FLAC, WAV, WMA, and more. Convert audio/video to popular audio formats like MP3, FLAC, WAV, WMA, and more. 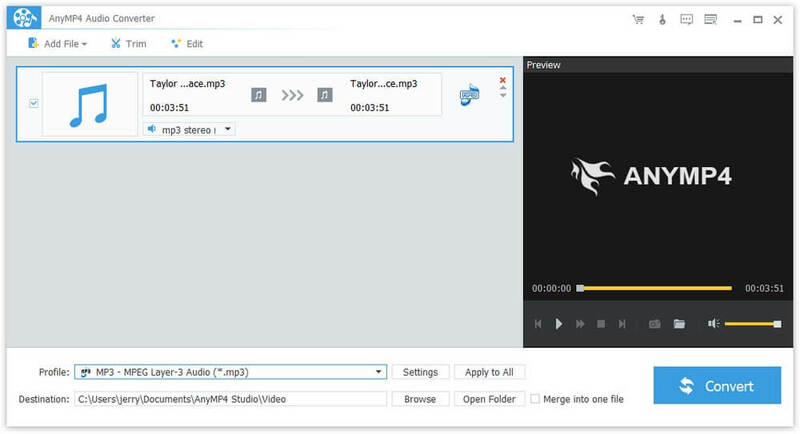 AnyMP4 Audio Converter not only convert audio/video to your needed audio formats like MP3, FLAC, WAV, WMA, ALAC, AAC, AC3, MP2, AIFF and so on, but also can customize the output file by trimming, merging , adjusting the audio settings and so on. Hence, you can enjoy them on your portable devices like iPad Air, iPad Mini, iPhone, iPod, Samsung Galaxy series and other devices. With this Audio File Converter, you can convert different kinds of audio files to other audio formats including MP3, FLAC, WAV, WMA, ALAC, AAC, AC3, MP2, AIFF and more. Therefore, you can enjoy them on your portable devices such as iPhone, iPod, iPad, PSP, PS3 and more. This Video to Audio Converter software also enables you to extract audio files from any videos formats like MP4, MKV, AVI, WMV, MOV, M4V, TS, MTS, and so on, and you are able to convert them to your needed audio format. Therefore, you can enjoy your audio at any time. It allows you to trim the audio length by setting the start time and the end time, merge two or more audio files into one single file, rename your audios to any name you like, and adjust the audio settings including Encoder, Sample Rate, Channels and Audio Bitrate. 4. Batch conversion with fast speed and super quality You can convert several audios/videos simultaneously. So with this Audio Converter software, you can convert audio/video in few minutes. And the quality of your audio will not be effect. Its overall effects will better than before. Statement: First, please download the orginal installation package by clicking the download link. Of course you may also download it from the publisher's website. Using AnyMP4 Audio Converter crack, key, patch, serial number, registration code, keygen is illegal. The download file hosted at publisher website. We do not provide any download link points to Rapidshare, Hotfile, Depositfiles, Mediafire, Filefactory, etc. or obtained from file sharing programs such as Limewire, Kazaa, Imesh, Ares, BearShare, BitTorrent, WinMX etc. Software piracy is theft. If you like AnyMP4 Audio Converter please buy it.